When it comes to making light work of your ironing pile, a Morphy Richards iron should be your first port of call. Equipped to glide over your clothes with effortless ease, this collection of Morphy Richards irons comes with a whole host of high performance features, including optimum reservoir capacity, auto shut off, exceptional heat up time and ceramic soleplates. 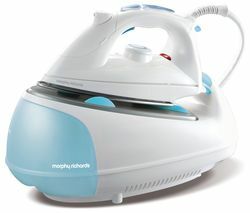 But that’s not all, the majority of models available in our Morphy Richards iron range also boast high pressure systems that have been designed for easy crease removal. Powerful, efficient and easy to use, all of our steam generator irons will allow you to tackle distressed upholstery, creased curtains or creased shirts with effortless ease and commitment. Many of the models available our collection of Morphy Richards irons also feature extra-large water tanks, meaning you will be able to take on mountains of laundry, without having to worry about keep filling up! 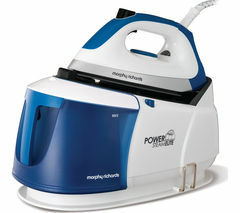 For the easiest use and clean, look no further than the Morphy Richards Power Steam Elite range. With its easy clean lime scale management system, you’ll be able to achieve a pristine, high quality finish without being slowed down by lime scale! Great news if ironing isn’t your favourite household task! We have a wide range of irons available, from cordless irons, hand steamers to garment steamers. Take a look at our full iron collection for an iron that best suits your needs.